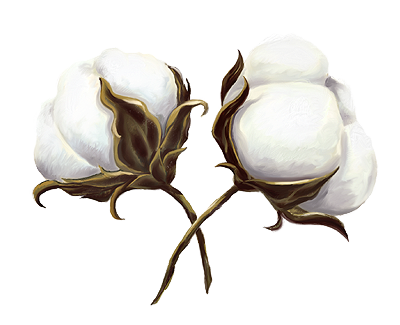 Our products are made of high-quality 100% cotton percale, woven with 200, 400, 500 and 600 threads. This fabric is noticeably tighter than the standard type of weave used for bed sheets. It is perfect for bed linen: 100% cotton percale is made of natural fibres which produce a comfortable, crisp and fresh fabric that allows the body to breathe in contrast to polycottons and other blends. Percale bedding is the finest available. The high thread count gives the fabric a soft and smooth feel which increases after each wash.
Cotton sateen is made by using a special weaving process which gives the fabric a satin-like finish. The pure cotton sateen fabrics we use for our exclusive bedding are Italian fabrics; woven, dyed and finished by Gruppo Martinelli Ginetto, a manufacturing company based in Northern Italy. Italian weavers are known for their weaving methods and looms that are incomparable with any other country in the world. Martinelli Ginetto is well known for its outstanding quality fabrics and supplier to renowned brands like Flou, Etro, Frette, Calvin Klein, Liu-Jo, Ralph Lauren e.a.. The 100% cotton sateen fabric is available in two different thread counts: 300 and 600. These fabrics are ideal to produce luxurious sheeting with a soft and smooth feel. Our fabrics come in a large variety of trendy colors for amazing mix-and-match possibilities.